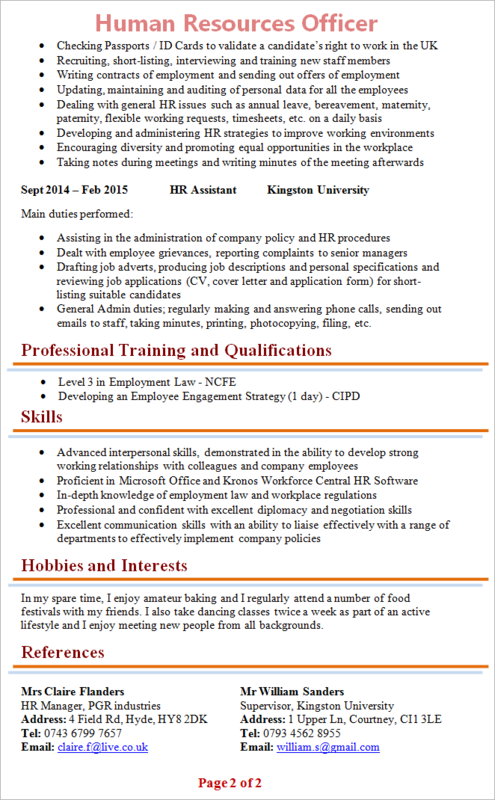 Tip: Use the HR Officer CV Template below as an example to help you write your own personal and fully-tailored CV. I am a highly organised, dedicated and diplomatic Human Resources Officer, with a proven ability to improve working environments and a commitment to employee welfare. Sensitive to employee concerns, I possess strong interpersonal skills, demonstrating the utmost discretion and integrity when dealing with confidential information. I am also proficient in business, reflected in familiarity with payroll systems and employment law. General Admin duties; regularly making and answering phone calls, sending out emails to staff, taking minutes, printing, photocopying, filing, etc. In my spare time, I enjoy amateur baking, and I regularly attend a number of food festivals with my friends. I also take dancing classes twice a week as part of an active lifestyle, and I enjoy meeting new people from all backgrounds. Administrative skills: One of the key features of an HR Officer’s job is to manage a lot of data, records, information, forms, documents and computer systems. 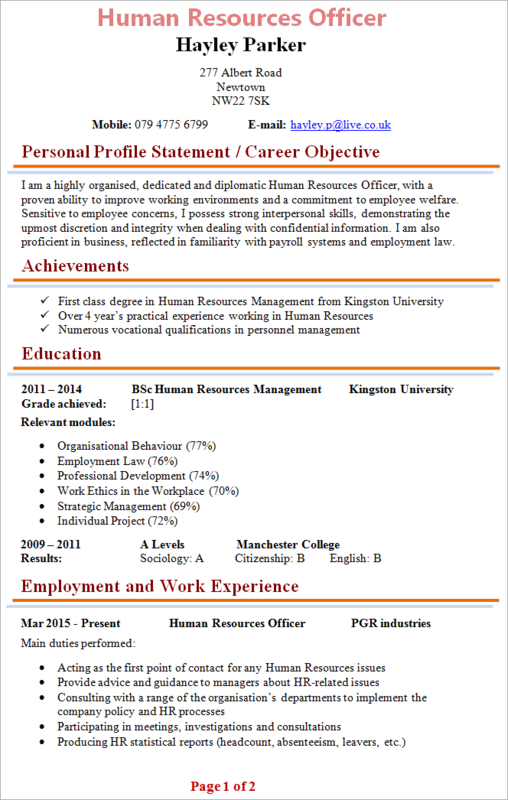 You should emphasise on your CV your administrative and organisational skills to demonstrate that you have what it takes to be a successful HR Officer. Good with people: You will be dealing with a variety of professionals, from all backgrounds, on a daily basis. It is, therefore, a critical requirement that you will be able to get on with people and have excellent social and communication skills. You could indicate list down these skills under your CV’s Skills section and give a relevant, real-world example for each of the attributes mentioned.